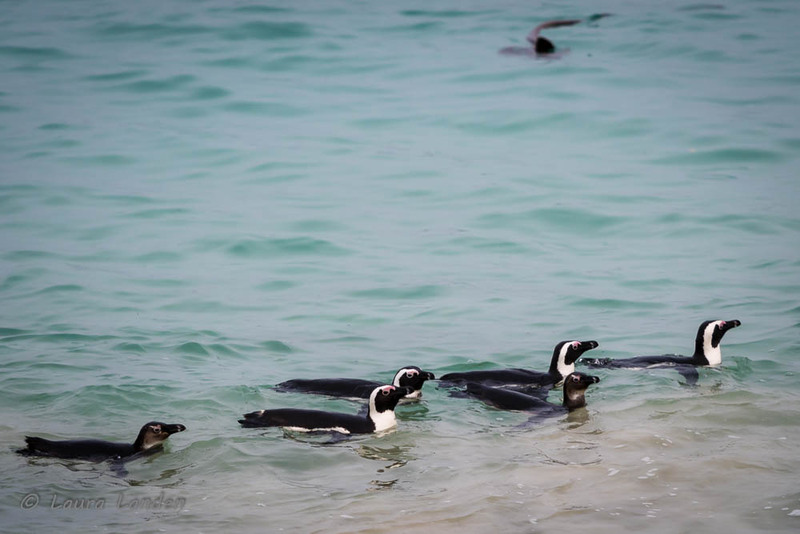 A colony of African Penguins (Spheniscus demersus), also known as Jackass Penguins because of their call, nestles on the Cape Peninsula in South Africa. Nestled as well are the penguins in their nesting burrows. Other residents include Rock Hyraxes and visitors such as Cape Wagtails, Egyptian Geese, and Blacksmith Lapwings. African penguins are closely related to Magellanic Penguins (Spheniscus magellanicus) and Humboldt Penguins (Spheniscus humboldti). The three species can be distinguished by their location. 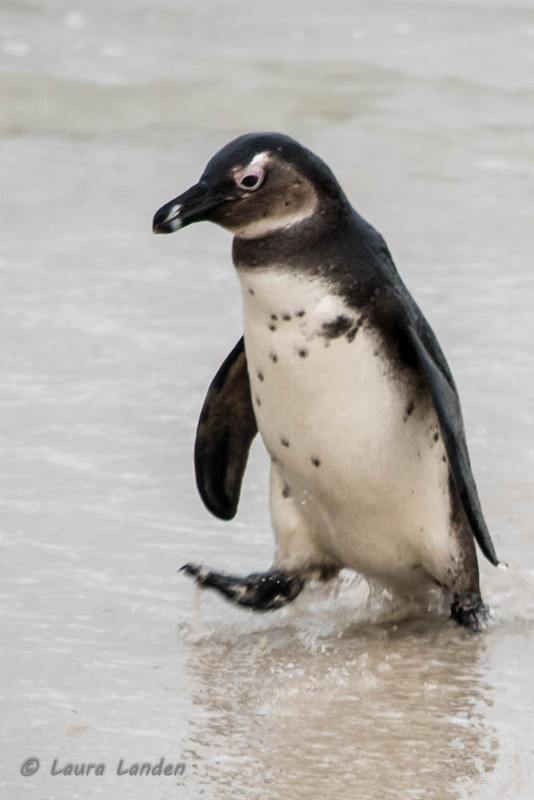 As their name suggests, African Penguins come to land to breed along the southern border of South Africa, whereas Magellanic Penguins breed along the southern coast of South American, in greater concentrations on the Atlantic side of that continent, and Humboldt Penguins nest further north, along the coast of Peru. They also vary in appearance. 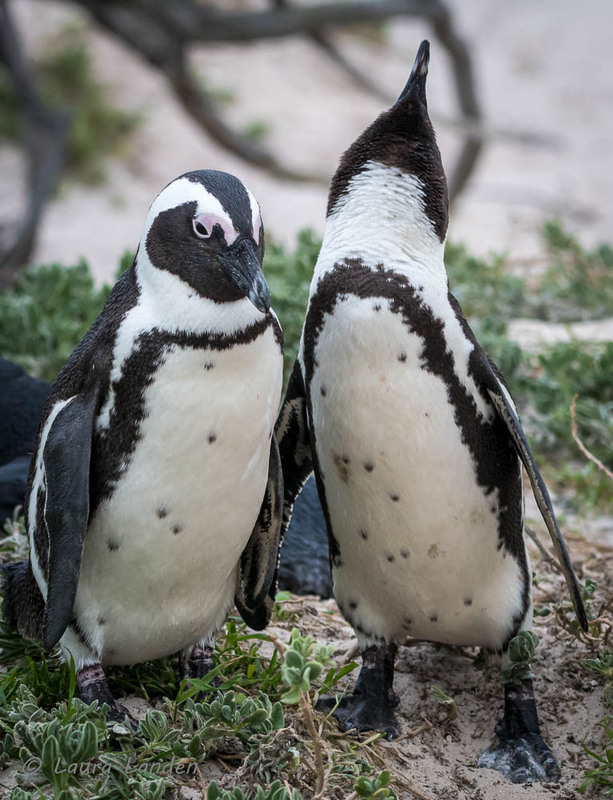 African Penguins generally have a bare (pink) skin patch that extends over the eye, and have a single dark breast band. 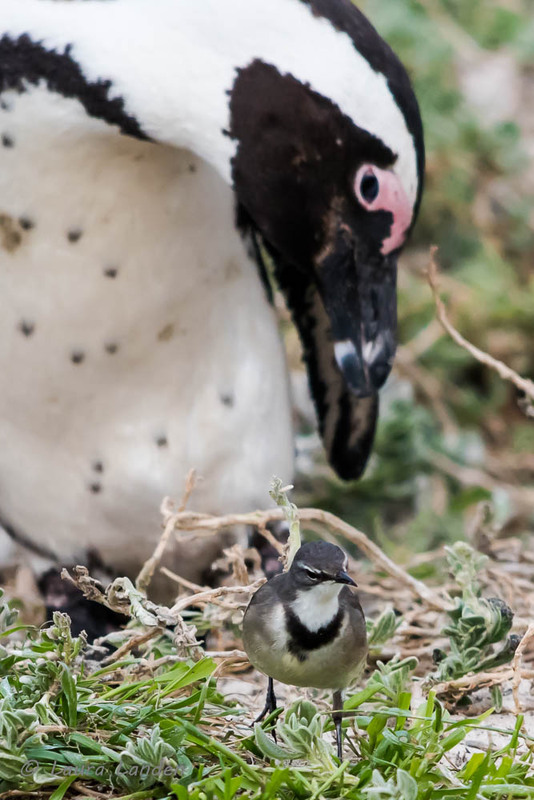 Magellanic Penguins have a less extensive bare patch and a double breast band. 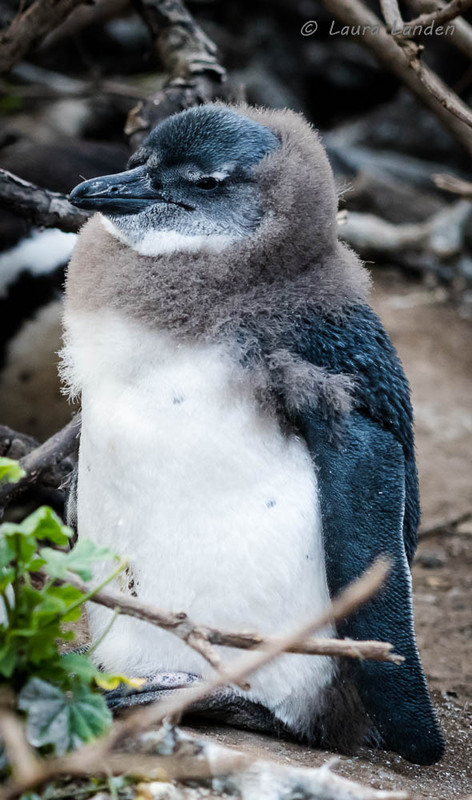 In Humboldt Penguins, by contrast, the bare patch extends under the chin, and there is a single breast band. Visitors access the colony via an extensive boardwalk. As one walks along, one sees Rock Hyraxes feeding and adult and juvenile penguins near their nesting burrows. The young birds are of various ages, as breeding is poorly synchronized. Some are still in their downy plumage from birth, others have more adult plumage, still others are already heading out to the near shore to feed for themselves. It takes approximately 14 months for the birds to reach adult plumage. The birds head out to feed singly or in groups. Watching them return to land and an upright posture can be very entertaining. In the next image, “Penguins Heading Out To Feed,” I think the animal further out is a Southern White Sea Catfish, but that is only an educated guess. If anyone reading this can provide a more definitive identification, I’d be glad to know of it. It is not a shark, I am fairly certain. Upon returning, the adult birds frequently reinforce their pair bonds by calling and by posturing and bowing to one another. Enjoy this little gallery of penguin pics!